Department of Financial Management, Faculty of Management Studies and Commerce, University of Jaffna, 40,000, Sri Lanka. Department of Accounting, Finance and Informatics, Kingston Business School, Faculty of Business and Law, Kingston University, Kingston Hill, Kingston Upon Thames, Surrey KT 27 LB, United Kingdom. Research aims: This study aims to investigate the prevalent choice of capital investment appraisal practices and the influence of firm characteristics on the choice of these practices. 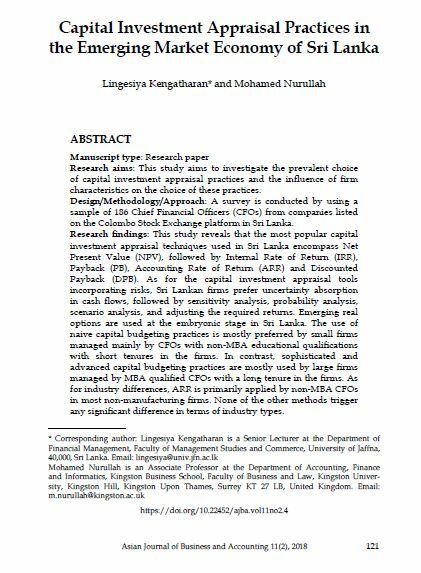 Design/Methodology/Approach: A survey is conducted by using a sample of 186 Chief Financial Officers (CFOs) from companies listed on the Colombo Stock Exchange platform in Sri Lanka. Research findings: This study reveals that the most popular capital investment appraisal techniques used in Sri Lanka encompass Net Present Value (NPV), followed by Internal Rate of Return (IRR), Payback (PB), Accounting Rate of Return (ARR) and Discounted Payback (DPB). As for the capital investment appraisal tools incorporating risks, Sri Lankan firms prefer uncertainty absorption in cash flows, followed by sensitivity analysis, probability analysis, scenario analysis, and adjusting the required returns. Emerging real options are used at the embryonic stage in Sri Lanka. The use of naive capital budgeting practices is mostly preferred by small firms managed mainly by CFOs with non-MBA educational qualifications with short tenures in the firms. In contrast, sophisticated and advanced capital budgeting practices are mostly used by large firms managed by MBA qualified CFOs with a long tenure in the firms. As for industry differences, ARR is primarily applied by non-MBA CFOs in most non-manufacturing firms. None of the other methods trigger any significant difference in terms of industry types. Theoretical contributions/Originality: This study makes contextual contributions by providing evidence of the application of capital investment appraisal practices in an emerging market economy, namely Sri Lanka. This study also provides parametric contributions as it identifies the influence of firm characteristics on the choice of capital budgeting practices. Practitioner/Policy implications: This study raises the awareness of top management, policy makers, practitioners and stakeholders of companies with regards to capital investment appraisal practices and the influence of firm characteristics on these practices. Research limitations/Implications: A more detailed study encompassing other countries with a similar culture like Sri Lanka is beneficial for further validation, replication and generalisation. Future studies may also consider looking at the influence of behavioral factors in making capital budgeting choices. KENGATHARAN, Lingesiya; NURULLAH, Mohamed. Capital Investment Appraisal Practices in the Emerging Market Economy of Sri Lanka. AJBA, [S.l. ], v. 11, n. 2, p. 121-150, dec. 2018. ISSN 2180-3137. Available at: <https://ajba.um.edu.my/article/view/15279>. Date accessed: 25 apr. 2019. doi: https://doi.org/10.22452/ajba.vol11no2.4.